There are no two ways about it... I'm a plant person. And my obsession has gotten so bad that I'm running out of places to put my greenery. So today I'm sharing a fun project that will give you another spot to display your beloved succulents - on the wall! If I have the choice between placing a plant on a shelf or suspending that plant in the air, I'm going to suspend it. Save the precious shelf room! 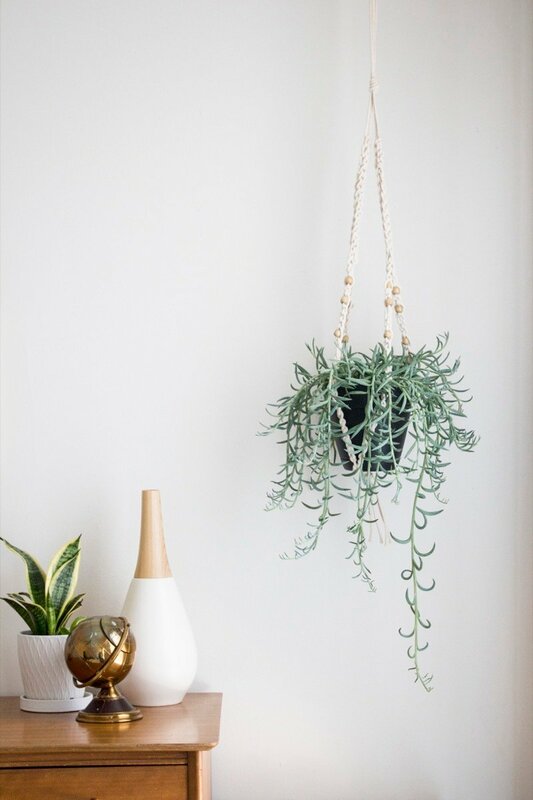 This beaded plant hanger is a cool and unique way to get those plants in the air! How To: 15, Easy Low-Maintenance Plant Projects. It's pretty incredible, really: plants that have developed in low-light conditions in the jungles of South American and Asia, with remarkably clean lines and tight textures that work amazingly in inside conditions in homes around the globe. Low amounts of work, and quite the domestic payoff. Apartment Therapy has assembled fifteen of their favorite easy houseplant projects from 2009, which add a fun, intentional element with no fears of black thumbin' it. A succulent is a beautiful thing. "Many of the following projects involve these easy-care beauties, while others are just simple but inspiring gardens and planters, some of them for small spaces, some for low-water situations, and so on. Enjoy!" How To: Use Air Conditioner Condensation to Water Plants. Condensation...it's everyone's first science experiment. Place a cold thing in a warm environment, and water vapor gets cooled to its dew point. So, what's a big cold thing in an even bigger warm environment? Well, your air conditioner, for one, and it condensates with the best of them. Translation: free water, perfect for giving your garden a drink. Kyoeul Umbrella Stand Waters Your Plants. 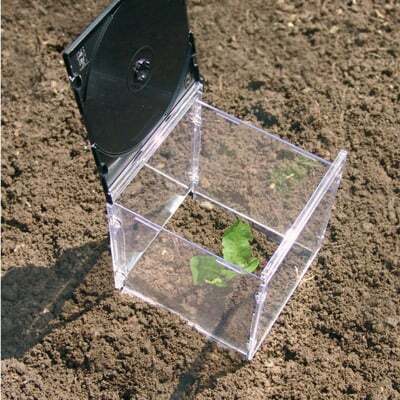 Make a Three-Tiered Plant Stand from a Recycled Tomato Cage. The Makezine blog points out this living art/seed starter: a wall-hanging plant holder from Opulent Items. The plants are watered by the included reservoir, and the plants naturally grow forward (out), because that's whence the light comes. The included diagram (below) makes it seem like they want you to DIY one; which is totally preferable to dropping $250 on a manufactured model. The Top Ten Winter Houseplants. Just because it's all frozen outside doesn't mean your green thumb gets to lie dormant all season. Instead, move your green friends inside. Here's ten hearty varieties to get you started. The Top Ten Air-Cleaning Plants. "Next time you go shopping for home cleaning supplies, consider adding large-leaved plants for every room in the house. They reduce unhealthy pollutants as well as airborne bacteria and fungi while adding the humidity needed to combat respiratory and allergic conditions." How To Keep Your Plants Alive During Winter. "The bench frame and top are made of 2-by-6 decking. (We used redwood, but you could substitute cedar or pressure-treated lumber.) For a comfortable seating height, choose pots that are about 18 inches tall and wide (no wider than 19 inches for this bench). Look for thick-walled, wide-lipped pots that have been glazed (that is, hardened); avoid unfired terra-cotta. For safety, lift bench top periodically and check pots for cracks." Lucky Shamrock Plant: Now that I have it, how do I keep it alive? In celebration of St. Patrick’s Day, I treated myself to an Oxalis Regnelli, a.k.a. a Lucky Shamrock Plant. These are the flowering shamrock-like plants available just about everywhere this time of year, including most grocery stores. A quick question to coincide with alexrussell's avacado post: Has anyone ever tried to grow a fruit tree by seed indoors? If so, were you successful? Will you share your how-to experience with your fellow Curblians? We who suffer a white winter could use a breath of warmer climes!